This tutorial creates a shell for a report viewer/explorer. A ToolWindow on the left represents a list of reports. The right side of the form in RadDock contains three DocumentWindows, each representing a report. This tutorial demonstrates the layout of ToolWindow and DocumentWindows. 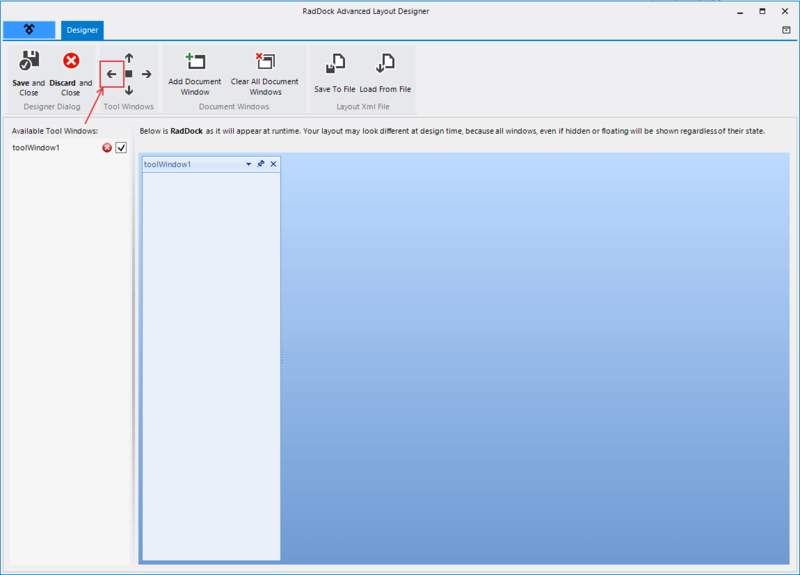 It also demonstrates adding a RadTreeView control to one of the created windows and synchronizing the active DockWindow with the selection in the RadTreeView instance. Figure 1: The final application layout. 1. Drop a RadDock control on the form. 2. Set the RadDock.Dock property to Fill. 3. Open the Smart Tag and select Show Advanced Layout Designer. This step will display the RadDock Advanced Layout Designer dialog. 4. In the RadRibbonBar on top, click the left green arrow to dock a new ToolWindow to the left. The list on the left side of the preview displays all created windows. From this list you can set the Visibility of the ToolWindows to false, if you do not need some of them visible at run time initially. 5. Again from the RadRibbonBar, click on the Add DocumentWindow button three times to add three DocumentWindows instances. 6. Click Save and Close button to close the dialog and save the layout to the RadDock. 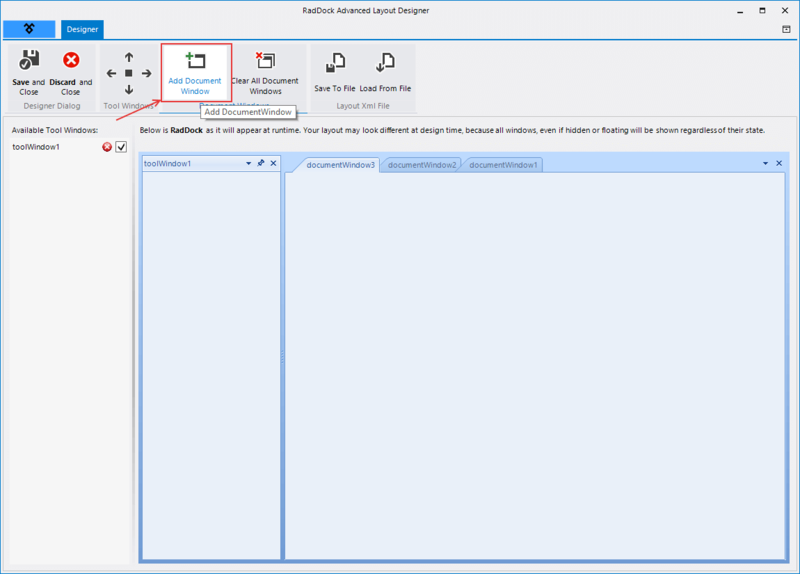 For more complex scenarios the advanced layout designer provides full drag and drop and user interaction support in the preview RadDock control. The real layout of RadDock which is displayed at run time is available only through RadDock Advanced Layout Designer. I.e. if you have hidden, auto-hidden or floating ToolWindows, they will be shown as such only in the advanced designer. In Visual Studio IDE we display ToolWindows in their docked state, which allows you to place and layout your controls in them. 7. In the designer select the ToolWindow on the left. You can verify this by checking that the currently selected component in the Properties Window of Visual Studio. 8. Set the ToolWindow Text property to "Reports". 9. Select one of the DocumentWindows. To do this in the designer, select the tab (i.e. on "Document1"), then click inside the client area. Check the Properties Window that you have selected a DocumentWindow. 10. Set the DocumentWindow Name property to "dwProductListing" and Text property to "Product Listing". 11. 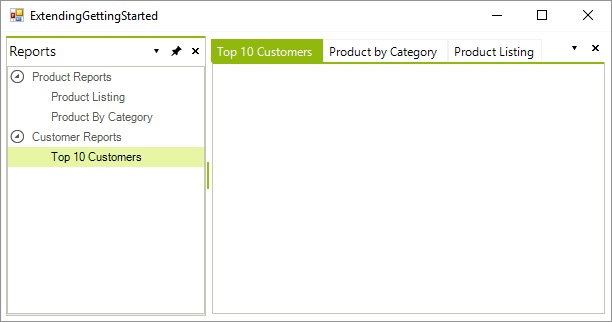 Select the next DocumentWindow, set the Name property to "dwProductByCategory" and the Text property to "Product By Category". 12. Select the last DocumentWindow, set the Name property to "dwTop10Customers" and Text property to "Top 10 Customers". 13. Drop a RadTreeView control to the "Reports" ToolWindow, set the control's Dock property to Fill. 14. Make sure that you have the Telerik.Wincontrols.UI and Telerik.Wincontrols.UI.Docking in the "using" (C#) or "Imports" (VB) section of the code. 15. Create a Form.Load event handler and copy the code below to it. This code builds the TreeView node structure and links the Name of each DocumentWindow to the corresponding Node.Tag property. Each dockable object has a Name property, a String that uniquely identifies it. Later, we use the Name to locate the DocumentWindow and activate it. 16. Create a SelectedNodeChanged event handler and add the following code to it. The code for this event handler verifies that the Tag of the selected node has a value. Further, if this value corresponds to the name of an existing window in RadDock, the appropriate DocumentWindow gets activated. Right-clicking document and panel tabs. Pressing Ctrl-Tab to invoke the Quick Navigator. Pinning and un-pinning the DockWindow. Using the ToolWindow and DocumentWindow menus by clicking the downward arrows.